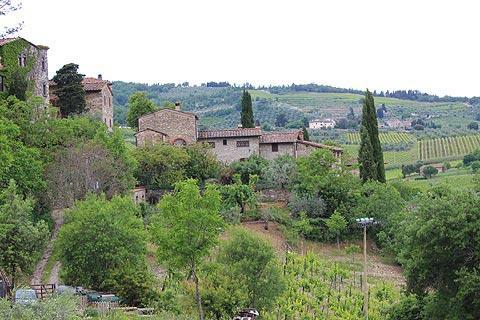 The small medieval village of Montefioralle is in the heart of the Chianti region of Tuscany, just a few kilometres from Greve in Chianti and the Strada Chiantigiana, the principal tourist route through the region. 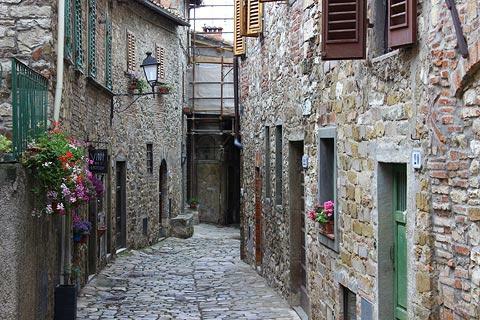 The village is now listed among the 'most beautiful villages in Italy'. 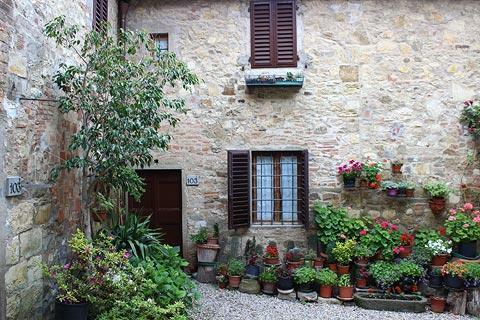 It is true that Montefioralle is really quite small and will not take you long to visit, but it is very picturesque and also has lovely views across the Tuscany countryside so a visit is recommended. You can park just outside the historic centre - don't try to drive in unless you are local and have a very tiny car! 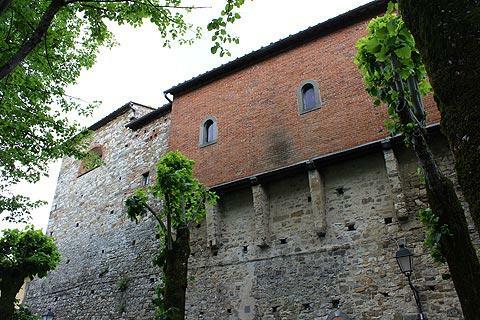 Montefioralle has retained its original village layout and is still surrounded by the original defensive walls. Your circuit through the village follows the ancient road just within the walls, that completely encircles the historic village. 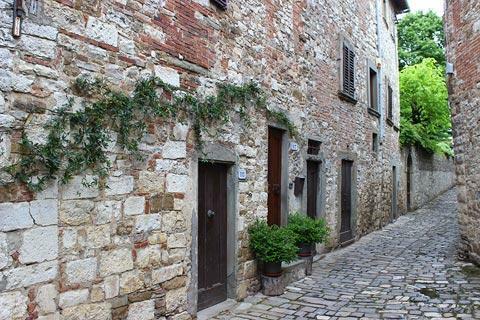 The road is pedestrianised and paved and has attractive ancient stone houses on either side. A small number of these have now been converted to wine shops and restaurants. 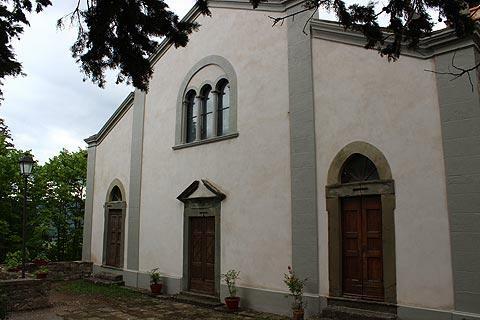 The principal historic monument in Montefioralle is the Church of San Stefano, which is at roughly the highest point in the village. Although the church has ancient origins and was originally gothic in style, the church we see today is largely a result of a 17th - 18th century reconstruction of the interior in the baroque style and a 19th century redesign of the outside of the church. One curious architectural characteristic of the church can be seen to the side, where the red-brick wall is supported on large stone supports to allow it to overhang the stone wall below.. Inside the church has a single nave and there are interesting artworks that span several centuries including the 'Madonna and Holy Child' by the Master of Montefioralle (13th century); the 'Annunciation among Saint John the Baptist and Saint Stephen' by the Master of Saint Ivo (14th century) and 'Trinity and Saints' by the Master of the Epiphany of Fiesole (15th century). 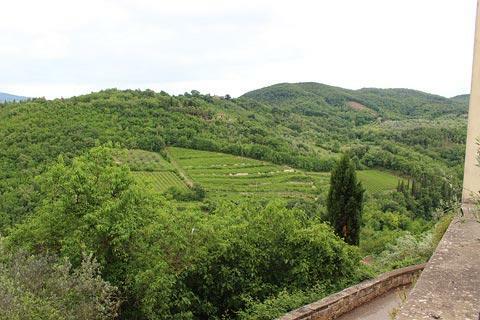 There are several places in the village where you have lovely views across the vineyards and olive trees of the Tuscany countryside, including the open area near the main entrance to the historic village. The narrow road that leads to the left from here follows outside the walls of Montefioralle - go around the road to take a look at the village from outside the walls to the west, one of the nicest views of the village. Note: this road continues west through some lovely countryside before joining the SP118 where you can turn left and continue to Panzano: if you are driving both ways along the Strada Chiantigiana in the same day this is an interesting alternative for part of the route. 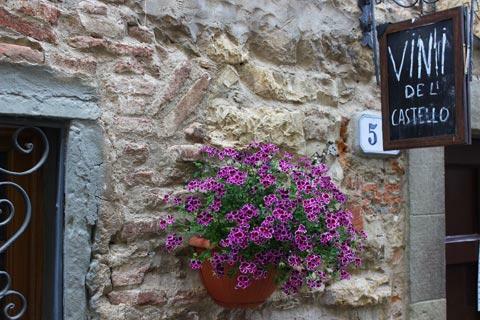 You can find more local travel ideas in the Chianti guide and the Tuscany guide.